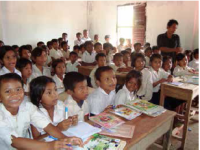 Cambodia suffers from an acute shortage of schools, particularly in rural areas. Only 1 in 5 primary school children attend two or more years of school. At the secondary level, attendance drops to 1 in 12 school-age children. the supply of Teachers - to the ​​​government through the Ministry of Education. Tabitha Cambodia liaises with the Village, Commune and District chiefs and a representative of the Ministry of Education. A wealthy villager often donates land for a school (or if there is a run-down school, the existing land is used). The land is transferred to the national government and ear-marked for a school. Tabitha Cambodia seeks funding for the planned school. When complete, the school is gifted to the national government to run and maintain. ​Over the life of this program, tens of schools have been built providing education for about 15,000 Cambodian children. In 2010-2011, 13 schools were completed. There are currently many more communities that Tabitha has identified as needing schools, and construction can begin when funding for the schools has been secured. ​The cost for constructing a school is about US$55,000 for a 6-classroom modular block with toilets and a water well. A full-size school of 12 classrooms (1 per grade level) costs approximately US$100,000. Depending on the needs and the funds available, schools either have 3, 6 or 12 classrooms. Often smaller schools are built with the expectation that they will be extended when further funds become available. On average, there are 80 children in each classroom. Attendance is maximized by having a morning class of children followed by an afternoon class for different children. Tabitha Singapore is now working with local supporters to sponsor collections of classrooms in recognition of Sue Huxley, a long term volunteer and supporter of Tabitha Singapore, who lost her battle with cancer on 5 March 2010. The first of the Sue Huxley Schools officially opened on 19 March 2011 in the Sapor Province of Cambodia. To read more about Sue's contribution to Tabitha and the schools we will build in her name please see below. For further information about making financial contribution for an entire school in your Company/Family name or about the school program in general, click here or contact schoolbuilding@tabithasingapore.com . Sue volunteered with Tabitha in Singapore for many years organizing house building trips to Cambodia and assisting with the co-ordination of Tabitha's Silk Fairs. Sue was our "Special Order Guru" when it came to taking orders. She was enthusiastic and knowledgeable of Cambodia's history, culture, food and people and made an excellent tour guide for the groups she led on house building trips. In 2005, Sue became the Team Leader for the Australian School parents' and friends' housebuilding trips, and spoke at many information events for AIS to promote Tabitha and our philosophy. She became a valued member of Tabitha Foundation (Singapore) in January 2008 and continued to provide her insights into the lives of Cambodian families at the committee level. In August 2009, during the annual house-building trip to Cambodia, Janne Ritskes shared her vision of building schools for the communities that Tabitha works in. Sue and her co-leader Lisa Newman were inspired by the opportunity to raise funds and participate in what was then only an idea. Not long after this Sue's health began to deteriorate following a cancer diagnosis. Sue's condition worsened and she was unable to be a hands-on part of the Schools project. As a tribute to Sue, with the blessing of Janne and with the support of her husband David and children Sarah, Nicole and Christopher, Sue's family and friends around the world raised money to build the first Sue Huxley School which officially opened on 19 March 2011. The Sue Huxley Sapor School is currently educating 1,000 children from kindergarten to year six. The Sue Huxley Sandang School was completed soon after and serves 500 children living in and around Sandang Village in the Kompomg Thom province of Cambodia. Sue's legacy lives on in the lives of the children who are receiving an education and we at Tabitha are forever grateful for her contributions.